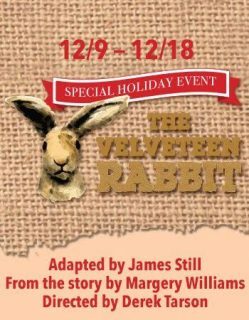 The Elmwood Playhouse of Nyack NY will be presenting “The Velveteen Rabbit”, written by James Still adapted from the story by Margery Williams and directed by Derek Tarson. “The Velveteen Rabbit” is a funny, lovely, and adorable family show for children ages 4 to 104. “The Velveteen Rabbit” runs December 9 through December 18, Fridays at 7 p.m. and Saturdays and Sundays at 11 a.m. and 2 p.m. Tickets are $15 General Admission. An enchanting play, aided by puppetry, about a toy rabbit who becomes real through the power of love from a six-year-old boy, and the boy’s journey to be accepted by his older brother. “The Velveteen Rabbit” features Harry Leavey (of Nyack), Marty Andreas (of Suffern), Tomer Ophir (of Tenafly, NJ), Sam Negin (of Englewood Cliffs, NJ), James Sarna (of Nyack), Steve Bermack (of Glen Rock, NJ), Emma Laurence (of Ossining, NY), Zachary Degen (of New City), Sawyer Ploski (of Nyack), Jennilee Aromando (of Yorktown Heights), Laura Rothschild (of Nyack).